Jill Tanner and Felicity La Fortune in Equally Divided. Photos: Meghan Moore. Ronald Harwood's Equally Divided (at the Merrimack Rep through this weekend only) often feels like a theatrical time machine: step in, and you're transported back to the days of Terence Rattigan and Tea and Sympathy, and a whole twilit world of melodrama populated by lonely women and ambiguously gay men, where much hangs on genteel-but-ruthless maneuvers. Indeed, the set of this four-hander is even stuffed with literal antiques - and is itself a railway car preserved from yesteryear (apparently a common living arrangement in southern England, where the play is set). So how you feel about antique vehicles may determine your response to the real, but limited, pleasures of this mild potboiler (which itself dates from a few years back). It's not that Harwood, who penned The Dresser and several successful films, has lost his touch - he still has a feel for badinage and how to construct a slow reveal. The trouble is that this time around, he just doesn't have all that much to reveal - or at least not much that feels new; the content of Equally Divided is almost as familiar as its format. 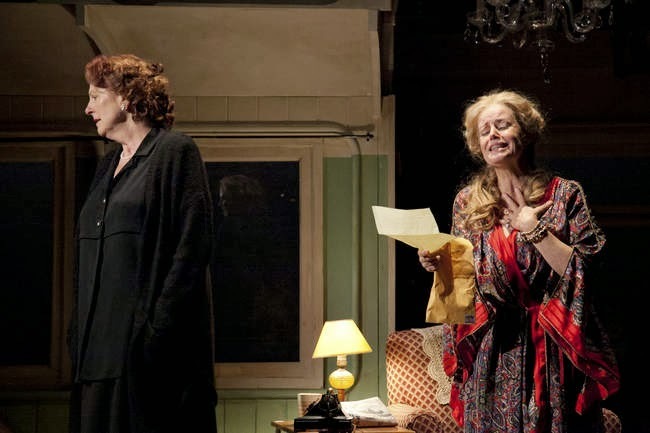 Not that the set-up isn't sturdy: dutiful, disappointed Edith (Jill Tanner) has nursed her difficult mother to the bitter end - and now her hopes of living her final years in comfort depend on the contents of Mom's will. Mom, however, always loved flamboyant, self-absorbed Renata best - and Renata (Felicity La Fortune), after having ignored Mom entirely in her failing years, has now arrived, "crying buckets," and assuming she'll get half the estate (even though after several marriages she's quite well off). So when Edith realizes that most of the estate's value resides in a handful of Mom's antiques, she's tempted to call in a sketchy art dealer to skim the cream off for herself. 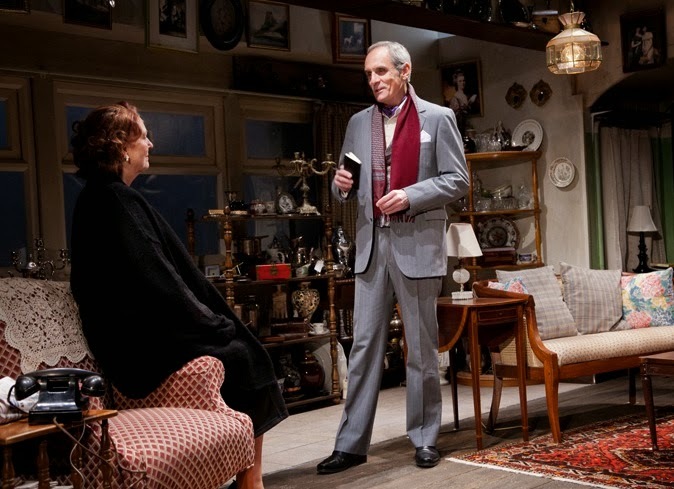 The resulting tensions recall Harwood's big hit, The Dresser, which memorably sketched a larger-than-life actor who walked all over his dutiful assistant; the playwright clearly knows this emotional territory, and precisely how it's mined with buried injustice and resentment. But he struggles to get far beyond his promising premise in terms of actual plot. Indeed, Harwood keeps making little gestures toward various intrigues, but then for some reason retracts them. For a moment, for instance, he hints that Edith herself may about to be fleeced; later we're surprised to learn that her BFF (whom she calls whenever a little exposition needs tending to) turns out to be not around the corner but hundreds of miles away. There's also some sort of near-romance in her past with a lonely doctor who may (or may not) have died of AIDS. We glean from these portents that many possible plots are in the air, yet none of them quite materializes - and seeming symbols like the railway car (which we imagine represents Edith's stalled life) never really achieve resonance, either. Thus the play's atmosphere can't quite qualify as ambiguous; it's more like ambiguously ambiguous. Jill Tanner with Anthony Newfield. Still, as noted, Harwood hasn't lost his touch with a quip or a comeback, and there are at least two superb performances to savor here. The eloquent Jill Tanner contributes a remarkable turn as Edith, limning every level of reticence to this sublimely reticent creature, while also suggesting the veins of longing that throb beneath her reserve. (I'd gladly listen to Ms. Tanner read the phone book, so honestly, hearing her essay a minor play by Ronald Harwood was something of a treat.) And only a small step behind is Felicity La Fortune as the innocently grasping Renata - La Fortune has less to work with than her co-star, but still nails a memorable portrait of a blowsy narcissist who simply can't perceive all the damage she causes. I didn't feel the men in the production were in quite the same league as these two leading ladies, but both are strong in their individual ways. Anthony Newfield smartly polishes the veneer of his antiques dealer with just a soupçon of deceptive wax, and Will Lyman bumbles and fusses appropriately as a would-be Romeo who's in far over his head. For his part, director Charles Towers shapes the action with his usual subtlety, but this time you can feel him almost pressing against the text, hoping against hope it conceals some hidden surprise, the way many an antique harbors a secret drawer. I don't think this one does. But with these actors on hand, I can't blame him for trying.